Super Graphics Super Lucky is a very colorful classic video slot game from Realistic Gaming. We have all the traditional fruit symbols on the reels and in the background we can see the peak of Mount Fuji. Once we started playing the game we were surprised to find out that there are some really nice animations here. Maybe that is why we have the word “super” in the game’s title. There are no wilds or scatter symbols but still there is a bonus symbol that will make playing Super Graphics Super Lucky memorable. 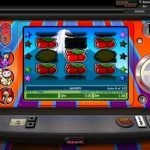 You will notice that some of the symbols have blue and green capsule attached to them and if you manage to land 3 of these symbols you will receive 12 free spins. The free spins round is played on a different set of reels and each time you land the capsule you will be in for a treat. The capsule on the middle reel will increase the multiplier by x1 and every time it appears it will open up to reveal one of the 3 characters. If you manage to collect all three characters you will win the jackpot amount in this game. 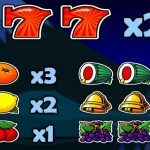 Super Graphics Super Lucky is an interesting game that is the perfect mix of traditional and modern. Realistic Gaming made this game in that manner to attract every kind of players, old and nostalgic and new gamblers at the same time. The game offers one special feature which is unique and it can improve your balance in a great way if you are lucky. The betting options are also worth the mention here, since they are created in that way to suit every player’s needs. We believe that you will enjoy this game if you give it a try. 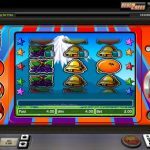 For another great engaging game you should consider playing Sunset Reels a 3 reel slot by Realistic Games.